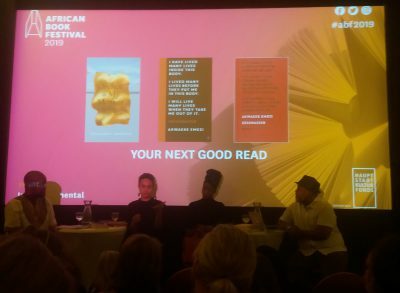 Our guest author Wiebke Beushausen attended the last day of the African Book Festival and wrote two reports about the panels “Your Next Good Read” and “Should All Writers Be Feminists?” for the Literary Field Kaleidoscope. This year’s African Book Festival went by way too quickly. After three days full of inspiring talks, readings and performances, the last day of the festival, again, held much in store for its many participants, organizers and an intrigued crowd of visitors. Out of the several tête-à-tête sessions and three panel discussions scheduled for this warm and sunny Sunday, I had the great pleasure of attending two wonderful, yet quite different, at times controversial panels. In “YOUR NEXT GOOD READ”, three experts of the book industry shared their personal selection of African fiction that inspired them in certain ways and were asked to ponder on the issue of canon formation. The question “SHOULD ALL WRITERS BE FEMINISTS?” sparked an intense debate among the three panelists on the implications of feminism in the African context, the supremacy of white, Western feminism but also the somewhat patronizing demand at the heart of Chimamanda Ngozi Adichie’s essay, which is widely considered as a seminal piece of work on feminism of the 21st century (link to her TED talk). This post focuses on the first panel. My observations of the second panel will be coming soon. Yana Makuwa, editor at Graywolf Press (link), spoke to us about Sulaiman Addonia’s novel Silence is My Mother Tongue (2018) and Akwaeke Emezi’s novel Freshwater (2018; transl. into German by Senthuran Varatharajah and Anabelle Assaf and published by Eichborn), which I particularly enjoyed, especially since I had the opportunity to join an event with Akwaeke Emezi at the internationales literaturfestival berlin last year (see the program of the special section on Decolonizing Wor:l:ds here: link). The novel is about a protagonist’s coming-into-transness and her traumatizing experience of migration from Nigeria to the United States where she is confronted with a surrounding that doesn’t have a language to describe her multiple identities nor understands Igbo cosmology. Jama Musse Jama, cultural activist, author, and founder of the Hargeysa International Book Fair (link) introduced us to the works of Nadifa Mohamed, The Orchard of Lost Souls (2013; transl. into German by Susann Urban and published by C.H.Beck) and Black Mamba Boy (2010; also transl. into German by Susann Urban and published by dtv). Jama Musse Jama’s own account of the closeness he feels in particular to The Orchard revealed to me once more the potential of fictional stories to deeply affect us. He grew up in Somalia during those times touched by war that the novel also depicts. Mohamed sets her story of three women of three different generations belonging to different parts of society against the context of dictatorship and destruction. A really pessimistic story with a prose full of sadness and beauty that will “capture your imagination and take your breath away” in Jama Musse Jama’s words. Two interesting reads were suggested by James Murua, writer, blogger and journalist. His blog jamesmurua.com is a great source for news about the African literary scene and reviews of the newest publications, and was nominated the Best Creative Writing Blog by the Bloggers Association of Kenya in 2018. The second book he presented was the anthology Story Story, Story Comes (2018), edited by Maimouna Jallow. It contains 12 children’s folktales from across the African continent, beautifully illustrated by Olusayo Ajeniunmobi, and is already translated into different languages. If you want to do the German translation you should get in touch with James Murua! And what would a canon be without a historical novel? The first book he talked about was Peter Kimani’s award-winning Dance of the Jakaranda (2017), a very complex narrative from multiple perspectives. In a rather functional prose, as James Murua desribed it, the novel deals with identity questions of what it means to be Kenyan in the hopeful times towards independence. It also sheds light on colonialism and the history of the indentured laborers from India. What was interesting was James Murua’s remark on how it was impossible to get this novel published in Kenya because of the sexual content. But after it was so well received (published in the US, awarded New York Times Notable Book of the Year), it has made its way back to Kenya. So, we see the circular flows, migration of books within an increasingly globalized literary field, where distribution however remains uneven. But what about the African literary canon? In fact, all panellists were rather critical about this. Jama Musse Jama pointed out how a canon forms a monolithic, solid group of works with high reputation which makes it hard to point out a canonical book’s blind spots or misrepresentations – which might be true. James Murua went even further saying that there is no such thing as one African literature. Instead, we should speak of literatures from the African continent; they cannot be crammed into a single canon due to the diverse genres, languages and styles. What was not made explicit was the question of power in relation to canon formation. Who actually decides which books and authors will be part of the canon, and on what grounds? Who are the gatekeepers? Who has the capital to write and read? What was said was that a canon indeed establishes boundaries, most likely with negative effects on emerging writers and their choices of topics and genre. Instead of one canon, Yana Makuwa suggested to put together collections in order to reflect on contemporary literary movements and styles, trending topics, or basically on what is considered “good” at the time. This could be a more dynamic, maybe less hierarchical way of shaping and making visible the diverse literary cultural traditions. Wiebke Beushausen has a PhD in literary studies from Heidelberg University. Her dissertation Dirty Skirts: Body Politics and Coming of Age in Feminist Fiction of the Caribbean Diaspora will be published openAccess by heiBOOKS this year. Currently, she is working at the Rosa Luxemburg Stiftung at the Center for International Dialogue.